Sheila Golding was born in Tiverton, Devon and educated at Tiverton Grammar School. She spent much of her working life working for the NHS while bringing up her children. Sheila discovered her love of writing in later in life, in 2009, and began spending her spare time writing poetry, some of these poems having been published over the years. She has also developed a love of writing children’s stories, and from this interest comes her first children’s book, “Teeny Tiny Witch”. 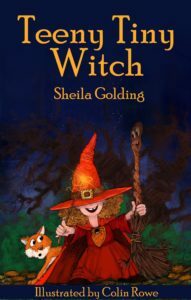 Sheila is extremely excited about her first children’s story being published saying ‘it is a dream come true’. Further stories are planned with at least a possibility of revisiting Witch Island and catching up with the adventures of Teeny Tiny Witch at some point in the future. Sheila now lives in Ilfracombe, Devon and enjoys walking coastal paths, sharing her writing with others, and spending time with her six children, eight grandchildren and two dogs.